This book was full of mystery and fast paced and her curiosity at times lands her sticky situations. This is a very fast-paced mystery, and Aggie’s curiosity gets her into some very sticky situations. Smart, But Dead receives a high grade from me. Ms. West’s words are witty (try saying that a few times quickly), the characters live and breathe, and I look forward to Aggie’s next adventure! 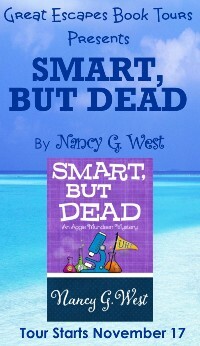 Smart, But Dead is a cozy mystery full of humor, suspense, heartache, and, in this case, panic and fear. The plot takes the reader all over the place. The story line itself was interesting, and the true murderer was revealed only after a series of unexpected twists. 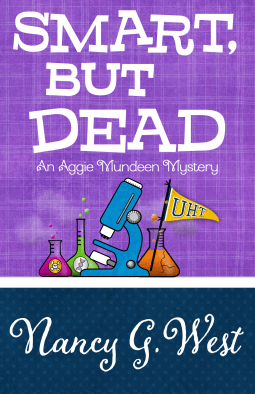 Smart, But Dead is easy to read and fast-paced, full of wit and humor…I found Aggie to be a fresh character in a cozy mystery character canvas. Skirting forty and appalled by the prospect of descending into middle-age decrepitude, Aggie Mundeen blasts off to the local university to study the genetics of aging. 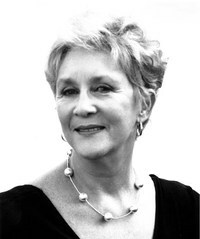 In addition to providing youthful hints for readers of her column, “Stay Young with Aggie,” Aggie is doggedly determined to stay young. Despite conflicts with her professor, she learns about the Human Genome Project and DNA. When she discovers a dead body, Detective Sam reminds her not to “help” with the investigation. But dangerously curious and programmed to prod, she races to solve the crime, winds up the prime suspect and is on target to become next campus corpse. Related subjects include: cozy mysteries, women sleuths, murder mystery series, whodunit mysteries (whodunnit), amateur sleuth books, book club recommendations, Southern humor, Southern living, and humorous murder mysteries.